London’s BFI Southbank is currently staging its now-customary end-of-year blockbuster season. 2016’s retrospective is Black Star, a celebration of the black community’s contribution to American and British cinema over the past century, masterminded by critic Ashley Clark and showcasing the work of such luminaries as Josephine Baker, Pam Grier and Spike Lee. 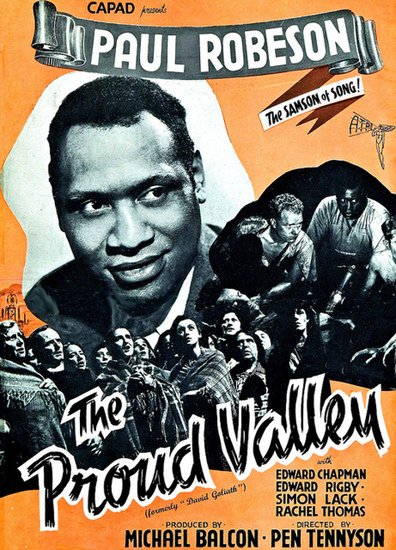 One of the most underappreciated and unjustly forgotten of all black stars is surely Paul Robeson, leading man, folk singer and later left-wing outcast. 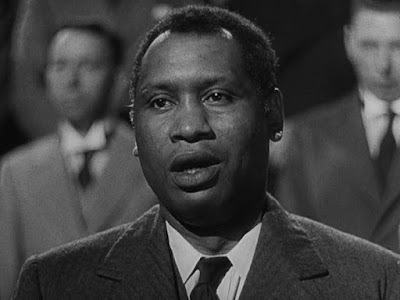 A major name in the 30s and 40s, Robeson fought tirelessly to overcome vicious stereotyping but has been out of fashion for some decades now, an oversight in dire need of correction and exactly the sort of wrong the ‘Black Star’ programme is seeking to address. Robeson’s naturally warm presence is well served by The Proud Valley, its screenplay written especially for him by Unity Theatre husband-and-wife team Herbert Marshall and Alfredda Brilliant. 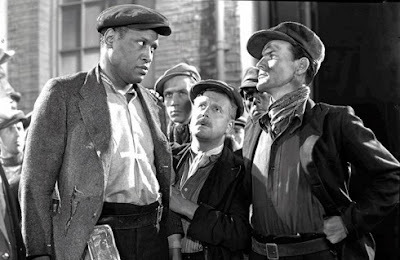 His hulking physique makes Robeson a plausible coal miner and is put to good use swinging a pick axe, hauling carts, crawling up slag heaps and later shouldering crumbling support beams at the film’s tragic climax. His unmistakable voice is also given its due, with the Samson of Song belting out both ‘Deep River’ and ‘Land Of My Fathers’ for his enraptured workmates. Robeson long maintained ties with the British mining community and took a keen interest in both its industrial struggles and way of life. The Mining Review newsreel below, 'A Star Drops In, captures him singing 'Joe Hill' for pitmen in Edinburgh in 1949. The rest of The Proud Valley’s cast, a mix of professionals and Welsh amateurs led by Edward Chapman and Simon Lack, also bring authenticity, with local sweetheart Janet Johnson especially charming. It is odd though that Marshall and Brilliant’s story, otherwise socialist to the core and unshakeable in its faith in organised labour and the working class, should require the rise of fascism and the advent of WWII to revive the men’s fortunes after a year-long pit closure. Production at the mine is only kick-started in order to meet government coal quotas - raised to fuel the war effort – a move that duly returns Blaendy to prosperity, securing its immediate future. Three cheers for Uncle Adolf! Robeson’s own outspoken political views and in particular his stated admiration for Soviet Russia led to any mention of The Proud Valley or its Leicester Square opening night being expunged from The Daily Express under strict orders from vengeful press baron Lord Beaverbrook. The film was nevertheless a modest success and became the first to be premiered on radio when its soundtrack was broadcast by the BBC Home Service. Although naturally a museum piece to modern tastes, The Proud Valley deserves to be mentioned in the same breath as John Ford’s How Green Was My Valley (1941) and The Quiet Man (1952) and remains a useful record of British mining in its prime. It should also be commended for its enlightened attitude to race (given its period). You’d have hope that, 76 years on, we might have heeded its simple message of brotherhood.